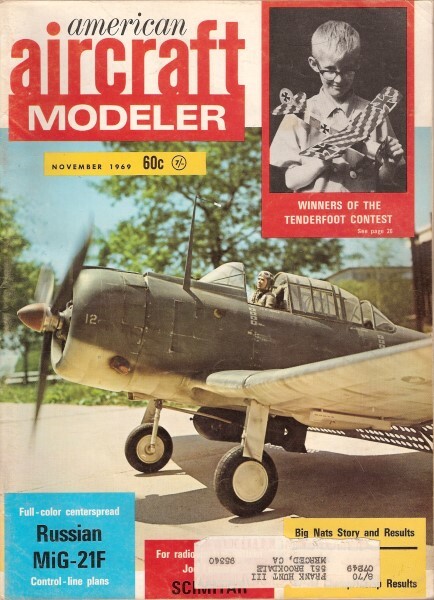 Here is the article for the Ryan M-1 Mailplane that I electronically scanned from my purchased copy of the November 1969 American Aircraft Modeler magazine, beginning on page 25. You might be able to scale up the image below if you cannot find suitable plans for sale. The article was written and plans drawn by Mr. Vic Harden. All copyrights (if any) are hereby acknowledged. From this design the Spirit of St. Louis was developed. Rubber-powered mod­el has details galore for the expert and clear instructions for the beginner. 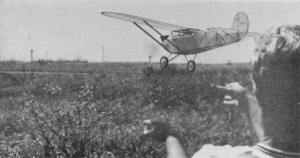 BEFORE 1926 few people had seen an airmail plane up close. But about that time the government began to award contracts to private firms to carry the mail. This was the real beginning of our present day air­line companies. Along with designs by Douglas, Boeing and others, was one built by the Ryan Air­lines School of San Diego. The aircraft per­formed well even with lower horsepower and a heavier Hispano- Wright engine, in place of a Wright J4 engine originally specified. Known as the Ryan M-1, the plane later became the M-2. Some were built with the Risso, some with the J4, for airline com­panies in the West. Then Lindbergh picked Ryan to build his airplane. As history records he was success­ful in 1927 on a long and lonely trip, from New York to Paris. His Ryan number 29 was a descendant of the M-1 and M-2. The similarity was evident between the M-l and the NYP Ryan used by Lindbergh. Our rubber-powered model is the Risso­powered version. It provides more nose length, giving a graceful and smooth appear­ance. A number of photographs exist of this version of the M-1 and M-2 as well as the J4 version. The American Airman Magazine, Vol. 4, No.7, of July 1961, shows two M-1/ M-2 Risso versions. General Aviation News Monday, March 24, 1969, carries a picture of the M-1 now on display in San Diego. You can build a full-detail-scale type, or a scale-outline type. Both types require about the same effort and both will per­form well. My model was a scale outline variety used to develop a larger diesel­engined job. The amount of detail will affect the final weight. Start with the wing since it is the most difficult part. Using the patterns for the spars, front and rear, aileron and false spar and centerline splices, each cut from 1/32" straight-grain sheet, make two of each except the centerline splice pieces. The rib template is cut from light gauge aluminum or tin. Use the template to cut 30 upper rib caps from 1/32" straight-grain sheet. Each rib should be 3/32" wide. In addition, cut 1/32 x 1/8" strips for the lower caps from the same material. The leading edge is 3/32" sq. and the trailing edge is 1/16 x 1/4". Trace the shape of the tip on a piece of cardboard about 1/16" thick. Cut out at the inside line and use it to bend the 1/32 x 3/32" laminations to shape. Soak the wood in hot water a few minutes, then bend it around the cardboard form, holding the strips in place with pins pushed into any soft mate­rial used as a flat base. Use an oven at 1250 F to speed up the drying time to a half hour. Two sets are required. The wing structure can be set up over wax-paper-covered plans. Trim the forward ends of the lower rib caps to a 45-degree angle and assemble them in place with the spars, trailing edge pieces and leading edge strip. The upper rib caps are trimmed to match at the lead­ing edge with a 45-degree angle cut, and to fair at the trailing edge on the lower rib cap. Build the wing, including the ailerons, as a single unit. Cut away the ailerons after the tips are completed. This assures alignment. Now for the horizontal and vertical surfaces. Make up the cardboard forms (same as for the wing tips) and bend the 1/32 x 1/16" laminations into place on the forms and dry as before. By now your wing tips should have dried and those laminations can be glued together holding them in place on the form to fix their shape. When the glue dries on the tips set them up in place to fair with the leading and trailing edge pieces, block­ing up in position. Glue all the contact posi­tions with spars and other structure while still over the plans. Cut out the rib and spar strip material for the tail surfaces from sheet stock; also the fuselage material can be cut to required sizes. The tail surfaces now can be laminated up on the form with glue and set aside to dry. The wing halves can be taken up and checked for size and condition. If OK, set them up on a level surface with approximately a 3/4" block under each tip, adjusted so the center section of the spar stubs lay flat and each tip is raised the same amount. Adjust so that the splice webs will fit between the ribs with the leading edge in a straight line tip to tip. Check everything for alignment and position and then glue the splice webs into place on the spar stubs. Now the tail surfaces, horizontal and vertical, can be assembled. Shim up the outline bow shapes so they center on the rib and spar depth. Cut the spars and glue into place over the plan. The rib material is trimmed to fit each location and glued in place. Set the assemblies aside to dry. The wing is now completed with the lower rib caps at the tip locations cut and glued in place. In­stall the center rib caps and two center­section trailing edge ribs with the false spar at center. Cut and fit the gussets and fairing blocks, gluing them in place as shown. Now the wing assembly can be sanded smooth, leading and trailing edges and tips faired and contoured to shape. Refer to the rib sections for contour. Install the filler blocks at rear spar for lift strut attachment point. Take up the tail surfaces and fair in the ribs, spars and edges to the typical section shown on the plan. Sand the assemblies smooth, cover with your tissue and water­shrink. Hold the parts in position to pre­vent warping. Cut the control surfaces away, install the aluminum strip hinges if you choose, then set aside. The fuselage is the usual box-frame-type construction, using 1/16" sq. longerons, forward fuselage uprights and diagonals. The aft section uprights and diagonals are 1/16 x 1/32'" Build two side frames on the lower plan and let the glue dry thoroughly. Mean­while, cut out the required bulkheads, nose formers and webs shown on the plan from the stock size required. When the side frames glue is dry, take them up and join together with the formers F -1, F -2 and F -3, cross members and C-l and C-2. Locate the sides on the plan top view to keep the sides aligned. Complete the installation of the diagonals. When the glue is dry, glue on the 3/32" side panel sheets from the forward upright to the cowl block former (C-1) and up against the horizontal web (C-2). The cylinder block formers (C-3) mount on top of the web (C-2). The cylinder block sides (C-4) glue each end to (C-3) and along their lower edge to (C-2). After the cowl side panels are in place and the glue is dry, the lower cowl cover of 1/8" sheet stock can be fitted and formed to match the cowl block former (C-1) contour. Glue on the 1/16" sq. cowl stringers between the two (C-3) formers, and add the 5/16" sq. soft balsa cylinder head blocks to the length shown, then rounded on top. Check alignment of the formers and the fuselage. Place a straight-edge or straight balsa stick about 10" long across the wing­mount position at both front and rear spar positions. The edges of these should be at the same level both sides of the center line on each end of each stick or straight edge. Also place one stick across the area where the horizontal will attach to the fuselage and sight to check their being parallel. Correct any out-of-line condition; this will affect the model's ability to fly well when completely assembled. To complete detailing add the aft rubber peg support, and its reinforcement - made from .010 or .015 plastic - glued to the inside of the support on each fuselage side. The 1/16" sq. longeron corners should be sanded to a radius along the length of the fuselage. Also the top longerons, vertical and diagonal members above the fuselage cowl for­mers F -2 and F -3 are sanded to a round section as these will be exposed on the completed model. Assemble the nose block unit from N-1, N-2, N-3, N-4 and N-5. Check its fit into former C-1 and the alignment with the cowl sides and cylinder block sides. Carve and sand N-3, N-4 and N-5 to form the contour blending with the cowling sides and bottom. Also form the profile or side shape shown on the plan. Note that the N-1 1/32" plywood disc is set at an angle to give both right- and down-thrust. Hold these angles as correctly as you can and drill a propeller shaft hole 1/32" dia. in the center of the disc and square to it. The propeller and thrust bearing will be held at the angle of the face of N-1 disc when the rubber motor is wound. When the fuselage wood work is done and sanded glue in place on each side of the wire the stubs for the forward landing gear struts. Form the 1/32" wire axle and .025 wire rear strut to the pattern shown on the plan. Solder the 1/6" dia. brass tube cross-bars to the axle. Locate and bind the axle wire assembly to the fuselage cross member at the centerline. Position the rear strut wire at the cross member and bind in place with thread. Align and insert the rear strut ends into the axle cross-bar tubes. Check for position of the complete assembly to the fuselage. Solder the rear strut ends to the cross-bars. Now cement the axle and strut bindings to the fuselage. Make up the two side-strut frames to fit on the wire stubs each side of the fuselage. Drill two 1/32" dia. holes in each 1/16" dia. brass cross-bar spaced as shown on plan, and solder 1/32" dia. wire stubs in place. Cut 1/16" dia. aluminum-tube struts for each side, and cement in place to form the side frame. Assemble onto fuselage wire stubs. with the axle wire between the alu­minum tubes of the side frame. Install a piece of plastic tube for a spacer on axle stub so the wheel will not rub the cross­bar with an elastic shock absorber thread tied in place. Install 1-7/8" dia. wheels. Cover the fuselage with your tissue over all areas except the forward upper cowl section under the wing mount, aft cockpit, and the wood covered area of the engine cowling. Water-shrink and give one coat of thinned clear dope. Spray the assembly with silver acrylic lacquer (spray can type will cover well). Using silver Christmas paper, not foil, cover the fuselage cowl, starting at the rear former. 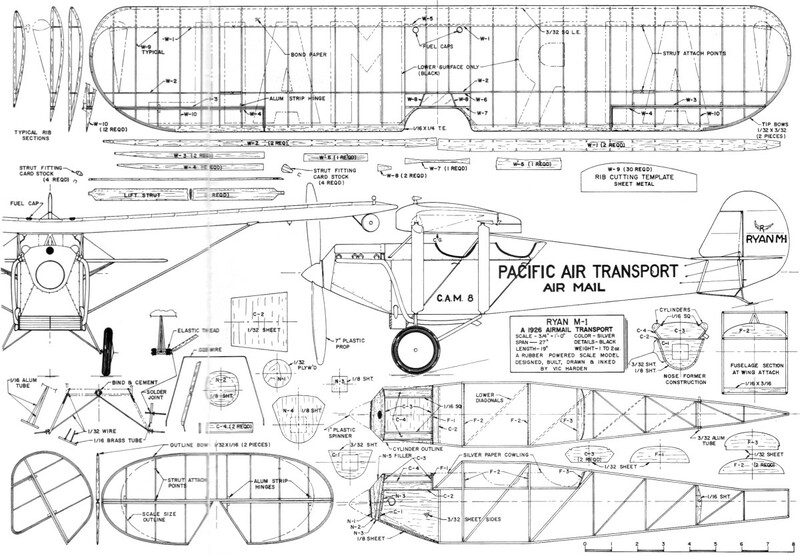 Make flat patterns to follow the former shape and lay flat on the fuselage frame sides. Proceed making one section between formers at a time, gluing as you go. You can also cut panel sections to cover the engine cowl section, simulat­ing the cowling divisions. Attach these directly over the wood nose-section structure as far back each side as the main gear for­ward-strut point. Add the tail skid, the inverted vee braces shown at wing mount to cowl top, cockpit­door outlines, fuselage lettering and door handles. Fold up the radiator from silver Christmas paper and attach to fuselage. Install rear landing gear strut fairings on the wire. Make up the exhaust piping from plastic soda straws and balsa elbows. Now you can choose the amount of detail you wish. Finish the cylinder blocks and heads jet black and the exhaust system silver. All lettering is black. With covering complete on the wing and tail surfaces, spray finished the same as the fuselage with silver acrylic lacquer. The wing and rudder can be lettered with black as shown - the rest of the details are lip to you. Control horns, made from .015 plastic, are easily made and installed. Gray thread is used for the rigging and control wire. Cement the horizontal stabilizer and elevator unit on the fuselage. Cut and cement the lower struts from fuselage to the horizontal stabilizer, checking to keep it parallel with the wing mount. Make a cardboard right angle template to set and glue the vertical stabilizer and rudder in place, being sure to keep the forward edge of the vertical on the fuselage centerline. Install the vertical to horizontal brace wires from silver thread. Cement the wing onto the upper fuse­lage longerons and cross members. Check to be sure. the wing extends the same dis­tance each side of the fuselage. Check for squareness to the fore and aft centerline of the fuselage by using a stick to measure the distance from the tail post to the same position on each side of the wing trailing edge. The model is turned over for the fitting and installing of the lift struts. Make up four struts as shown on the plan. Shape and trim to fit the wing and fuselage. Assemble the card stock fittings on the struts and paint silver. When dry, cement in place in positions shown on the plan. If you choose, navigation and landing lights can be in­stalled. Make the landing light tail cone from silver Christmas paper and attach it to a 1/32" bulkhead. Cement on an alumi­num-foil reflector surface and cover with a clear plastic bubble formed to size. 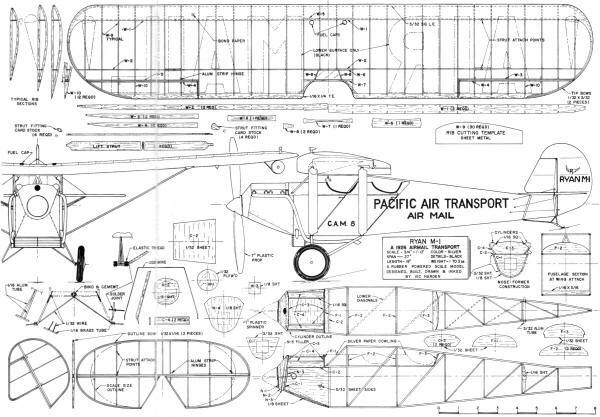 At­tach on under side of wing and install the small side brace between the front spar line and the side of the light assembly, as shown on the plans. Carve, sand and paint the navi­gation lights from balsa and attach as shown. You are ready to put in the rubber and start flying. Use a 12" loop of 1/8" flat rubber for a light model up to 1-1/2 oz., or four strands of 3/32" flat for a heavy model 2 oz. or over. The propeller can be your own thing. carved from the raw block, or one of the excellent plastic types for sale at your hobby shop. The 7" diameter seems to work best under most conditions. A plastic spinner 1" in diameter is fitted on the propeller. Assemble your propeller on a shaft through the nose block. using a good thrust-washer assembly or bearing for the best flights. Check the balance point indicated on the plans. Some people are lucky. Most of us have to put a glob of clay or some other mass to get the point to work out in the correct location. You try that glide test. Hopefully all goes well and a few winds are put into the motor for an added thrill. There she goes! Everything looks OK. Now for that real try: a couple of hundred winder turns and a minor adjustment and away he goes for a few rounds by herself. The fun is just beginning. Since with normal care this job won't destroy itself, many happy hours can be had learning all that the model can do under varied conditions; both indoors and out. Good luck and may fair weather be your !